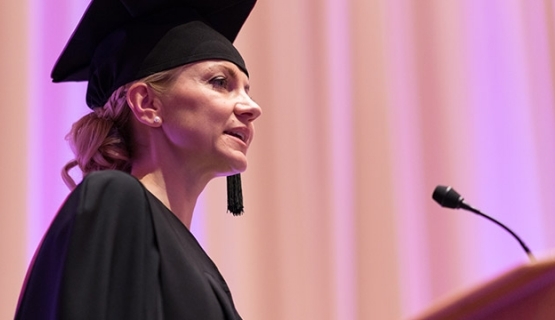 Annika Jyllilä-Vertigans gave the address of the graduate at the Aalto Executive MBA graduation ceremony on November 24, 2017. Dear Dean, Dear Professors, Dear Director, ladies and gentlemen. “The best thing for being sad," replied Merlin, beginning to puff and blow, "is to learn something. That's the only thing that never fails. You may grow old and trembling in your anatomies, you may lie awake at night listening to the disorder of your veins, you may miss your only love, you may see the world about you devastated by evil lunatics, or know your honour trampled in the sewers of baser minds. There is only one thing for it then — to learn. Learn why the world wags and what wags it. And that was T.H. White, The Once and Future King on the merits of learning. And I suppose it is this same shared yearning for learning and the willingness to dedicate time and effort into it, that brought us – the 2016 Aalto Executive MBA cohort – together. One of my dear colleagues calculated that over the past nearly 2 years, we have spent 54 module days together. In addition to these localized learning days, we have spent much more time on distance learning – with a careful estimate of 10h a week that’s taken some 1000 hours on top of the module days. On top of which is the business strategy project and with that maybe another 100 hours per person. So as a conservative estimate we end up with a figure of 1500 hours of learning, give or take. If we translate that figure into 8 hour working days that totals to 191 days. 191 extra working days crammed on top of all the other work. That is a lot. And that comes with a price. These hours and days and weeks meant evenings and weekends spent studying – away from our loved ones: families, friends. So, on behalf of all us graduating, thank you dear family members for your patience, your endurance, your love and support. We couldn’t have done it without you! And may I say, I think you too have graduated here today. We know that we have ticked a fair few boxes in terms of World Economic Forum requirements for future leaders." Well now to consider the rewards that we gained from committing to these EMBA studies in the context of our rapidly changing VUCA world. We know that we have ticked a fair few boxes in terms of World Economic Forum requirements for future leaders: We talk about complex problem solving, critical thinking, emotional intelligence – all subjects that we have studied and practiced to prepare us for future challenges. And all of that is great – but one of the major things we have received along our studies, maybe snuck up on us, as a bonus – and that’s the ability to learn effectively. Adopt vast amounts of information and make something out of it. This may sound obvious or on the other hand trivial, but then this is the year when a fair few companies have come out in saying that they no longer recruit specific competencies, let alone subject matter expertise. They recruit those who demonstrably have great learning abilities for the world changes so quickly, who knows what the strategic competencies of tomorrow are. We see the Davos wish list changing every year. And so it is the ability to adopt new competencies and have the innate trust in one's own abilities to do just that, that counts. This requirement applies for top management, leaders and directors who are forging tomorrows businesses and solving tomorrows problems. They recruit those who demonstrably have great learning abilities for the world changes so quickly, who knows what the strategic competencies of tomorrow are." Talking about solving tomorrows problems I will make a slight political detour, and say: I am glad to have made with my EMBA studies such a positive mark onto my personal timeline of 2016-2017: This sequence of years that has seen the world raise a regressively protectionist side of many a nation - and a face of intolerance. Going back to T. H. White’s remark of the evil lunatics of this world and his remedy for it - It is with learning and education, with embracing the values of global cooperation that we march forward together. I think Aalto university - And all of us graduates here stand for life-long learning and development. I would like to thank Aalto EE for taking these ideals forward. And learning is not only about ability – it is about having ideals and following those with determination - and curiosity. “Why is it that when one man builds a wall, the next man immediately needs to know what's on the other side?” That quote by the way is not from T. H. White, that’s from the Game of Thrones so sometimes learning comes from oddest of places. But the gist of it is true. In order to create the bucket list of tomorrow, we need to think differently. But first and foremost - We need to be curious. We as a team have had the wonderful opportunity to be curious together." I dare say we found the softer side of an engineer, the creative ebb of the mathematician and the innovative streak of the lawyer. We even made a behavioral scientist embrace the logic of one-piece-flow. Every single person of our 47 member team has brought something on the table and contributed in a unique way into this intensely positive experience. Two years ago I signed up for this EMBA program hoping to find education and opportunities – and a network, as they say - And I found so much more than that – I found friends to share thoughts and ideas with, to be curious with. I found a team with whom I feel safe to share my problems and sorrows with and importantly, friends who feel safe to share their worries with me. I found friends to share thoughts and ideas with, to be curious with." In other words, I found dear friends who absolutely mean the world to me now. And so finally I would like to thank my dear, dear student colleagues for the unwavering support we have shared and the good cheer we have had along this journey. We are the first Aalto Executive MBA team from which every single cohort member graduates together in the suggested time table. It by definition has not been easy. With challenging work alongside, for some of us taking over new positions in new organizations, having babies even. But no one dropped, we all made it. More than a few times, I feel, we carried each other across the finishing line. I would like to thank you all for that. Together we grow and even though our journey has taken two years so far – Really, it has only just begun. We have a lifetime ahead of us to share ideas, to learn, to be curious together. I for one look forward to that. A few weeks back, my little 4-year-old daughter came to me at a time I was up against another tight deadline and typing away on my computer. She said “Mum. I will give you all of my candy day sweets if you just come and play with me for a minute.” That was all the currency she had in the world. For a moment of play. You can imagine how I felt. So dear friends and dear families – I would like to conclude my address by saying: finally. “It is time to play”. Annika Jyllilä-Vertigans is Managing Director at Vieser. She is also a board member in several companies.